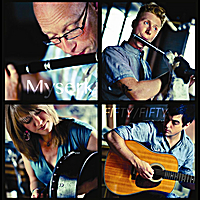 Founded by veteran flute player Brett Lipshutz and members of the accomplished Irish traditional group Cé (Randy Gosa and Asher Gray), Myserk explores the conversation between traditional music from Ireland, France and Brittany. Using a combination of wooden flute and strings, the group draws from these diverse musical cultures to create highly textured arrangements of traditional and modern tunes. Each set of tunes is a narrative that balances an interest in the unconventional with a deep respect for time-honored tradition. Milwaukee-based flute, whistle and bombarde player Brett Lipshutz has been playing various instruments since 1983. He has played Irish music for over 20 years and since then he has twice played at the All-Ireland Fleadh Cheoil and toured with the Trinity Dance Company. He has been involved in theater projects, school outreach programs and many recordings and radio broadcasts. Asher has been playing traditional Irish music since 1994 and was a founding member of Milwaukee-based groups, Anam Rí and Cé. Beginning with the bodhrán at age twelve, his versatile ability led him to later master the whistle, wooden flute, and Irish bouzouki. He has won numerous awards on whistle, flute and bodhrán at the Midwest Fleadh and competed in the All-Ireland Fleadh Cheoil. In 2000, Asher was the recipient of The Edward J. Ward Irish Music Scholarship, presented yearly at Milwaukee Irish Fest for accomplishments in Irish music. More recently, Asher graduated from the University of Wisconsin-Milwaukee in 2007 with a BFA focusing on Film and Art. He also received a Digital Arts & Culture certificate and completed the University of Wisconsin-Milwaukee Celtic Studies certificate program. Over the years, Asher has recorded seven albums, three of which were solo albums. In addition recording, He performs around the midwest and US, is involved as a faculty member at the Milwaukee Irish Fest School of Music and continues to be heavily involved in the Milwaukee Irish session scene. (from Haugesund, Norway) is a freelance Nordic folk musician on guitar, harding fiddle, fiddle and Greek bouzouki. He has a background in the traditional music from Rogaland (South West of Norway), and has a master degree in Nordic folk music at the Royal Academy of Music in Stockholm. Vidar is known from bands like Vidar Skrede DYNAMO BAND (with Pilvi Järvelä and Jani Kivelä from Tsuumi Sound System), Geitungen (Olav Christer Rossebø from Bergen Mandolin Band and Earlybird Stringband – and Håvard Ims), The Secret Carpet Club (with Emma Johansson from Eter, Seaquins – and Carl Nyqvist), AAMOS (with Kevin Henderson from Fiddlers’ Bid, Boys of the Lough, SessionA9, The Nordic Fiddlers Bloc – and Mark Laurenson). He has also performed with artists like Vegar Vårdal, Patrik Andersson, Frode Haltli, Stian Carstensen (from Farmers Market), Kristian Bugge (from Baltic Crossing), Niklas Roswall (from Ranarim), Zar (DK), Bodega (UK), Sver (NO), Liz Carrol (USA) and Bruce Molsky (USA). Vidar has appeared on national television in Norway and Iceland, and has been heard on radio across the Nordic countries and throughout the USA, which includes two live radio concerts at NRK P2 in legendary “Studio 19”. Vidar has released CD’s like “Geitungen – Bra Kast” (Grappa 2005 – awarded at the Norwegian Folk Music Awards), “Geitungen – Langt Ute” (Grappa 2010 – nominated at the Norwegian Folk Music Awards), “The Secret Carpet Club – Village” (Nordic Stomp 2011), “AAMOS – Caravan” (Nordic Stomp 2011) and “Vidar Skrede DYNAMO BAND – Happy Monkey” (Nordic Stomp 2013 – nominated at Emma Gaala – the Finnish grammy awards). Born in Wisconsin, she is classically trained on piano and orchestral harp. In the mid-70’s, Kim’s discovery of the Celtic harp grew into a profound love for the instrument, setting her upon the path of exploration for which she is now widely known. Kim has traveled with her harp from concert halls to grass roots folk clubs, from luxury cruise ships to remote mountaintops; she has performed concerts by candlelight, delivered singing telegrams and played herself on an episode of “Beverly Hills 90210”. Amy is a two-time Midwest Fleadh bodhrán champion and has competed in the All-Ireland Fleadh Cheoil na hÉireann. She’s been playing Irish music since 2003. In 2012 Amy joined the faculty of the Coleman Country Bodhrán School run by five-time All Ireland Champion, Junior Davey. She’s toured the east coast with Chicago based band, Bua and has had the pleasure of playing alongside John Whelan for several years at the annual Milwaukee Midwinter Set Dance Weekend. Amy is a founding member of athas and recently joined Myserk, two Milwaukee based bands. Amy has been teaching bodhrán at the Irish Fest School of Music since 2007 and has taught at the Milwaukee Irish Fest Summer School since 2008. She’s also taught for the Wisconsin Conservatory of Music. In 2005 Amy received the Celtic Studies Certificate from the University of Wisconsin – Milwaukee and was the 2008 recipient of the Ed Ward Irish Music Scholarship. Amy’s mentors and inspirations include Paul Phillips, Junior Davey, Colm Phelan, Jackie Moran, Paul Marshall, John Joe Kelly, Seamus O’Kane, Pat Roe, Martin O’Neill and Rob Forkner. She’s studied Latin percussion with local percussionist and salsero, Robert Figueroa.